Saturday morning I get a call from the old lady I rent a dock from, She says my searchlight is on and my boat is tilted. Its pouring out and has been all night. 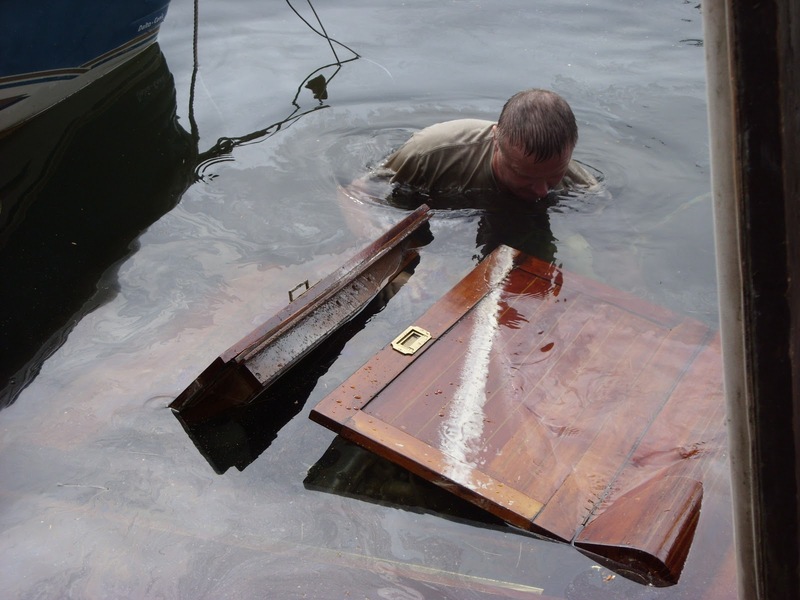 I drive over there, my just finished wood boat is laying in 6′ of water. 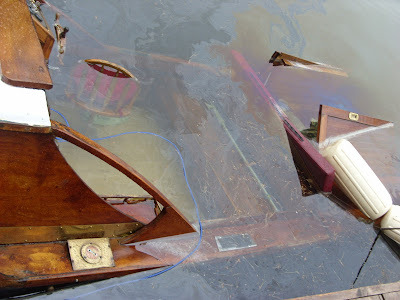 Yep the search light was on, the bilge bump burned out, the weight of all that rain pushed the transom down far enough that the water entered the blower vent and the blower fan just created a massive flow into the boat and it sunk. I know know what those birds in the Gulf FEEL LIKE WITH ALL THAT OIL ON THEM! Anyways I managed to dive under it and get a strap and come along on it using my plastic boat, a 2×6 and the dock to crank it out of the water. Got it even with the rails and pumped it out with a 350 gal per minute bump. Towed it back 4 miles to a ramp and loaded it on the trailer. Just as I was strapping it down a old lady pulls up and says she has always loved my boat and would I like to sell it. Didn’t know how to react to that but said I might think about it. So is someone trying to tell me something? So now I get to take everything apart and get it running again. You Can Buy A Brand New Dart Boat, Like It Was 1928. OMG!!!!!! !Wish we were there to help clean up. Wow! Not fun at all. Well, at least the water is clear enough to see a very nice looking boat under there. Good luck on the clean-up. Everything will dry out eventually, even the engine. Sorry Capt. Grumpy, I hope she's dry soon. At my first launch this summer, I had my mother drive the empty trailer back to the house. She cut the corner into the driveway and dragged my new trailer over a steel post mailbox. Scratched it up pretty good. Then I hauled the boat to Illinois. Must have ratcheted the cover on too tight, cuz when I got home, I removed the cover to see that I cracked my windshield. Its winter here, the boats are locked away and I aint even going to go look at them in case I find something to add to misery month!. There is some comfort in knowing they are no where near the water. What a great hobby. First Will someone do something with the runaway boat on fire in the new header. That is a story. Maybe you are right. It is time to embrace your and everyone else's pain. This story get worse each time and now with pictures. You might get the nickname Capt. Hazelwood. My condolences. I once had the low speed orafice on the carb of an outboard blow out of the engine and dump alot of fuel. It is the worse feeling. There is alot of it going around. Sorry for your pain. You have to live closer to your boat. Good luck. If anyone wants to help de-water it, Im in Meredith NH this weekend working on it. Spent the weekend working on the boat. Changed the oil 4 times, plugs, cap points, fuel etc. All better now, in the water next weekend! SO the misery is short lived! Just an update: I used this boat all that summer 3 other boat shows without an issue. Resting nicely in my garage this summer. 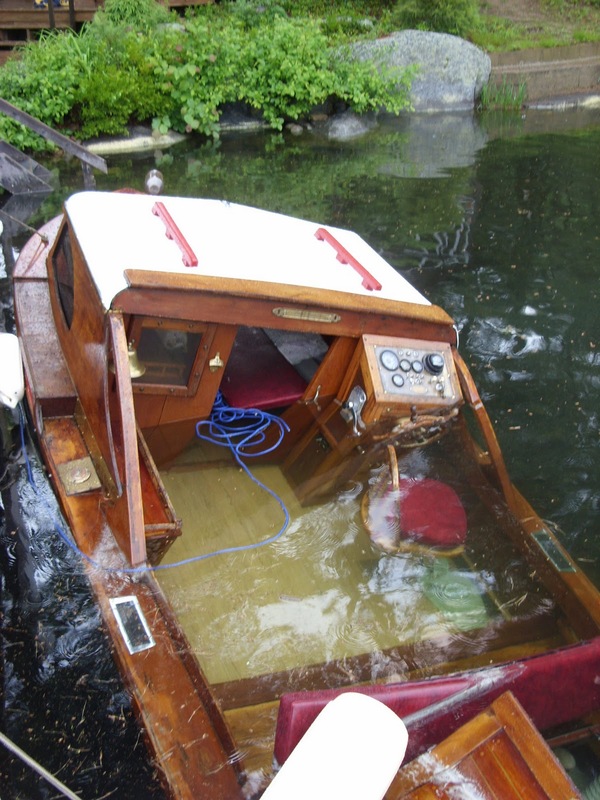 A can of spinach Popeye and you’ll have your boat up and going again.